A two-sided approach that captures hearts and minds. Columbia Business School (CBS) came to Suka seeking a visually compelling way to communicate the unique benefits of its Executive MBA program to prospective students. As a long-standing client, CBS asked us to create a piece that would enable these potential students to see the possibilities of the program — and inspire them apply. Earning an MBA while working full time can be daunting. To empower professionals to advance their careers, CBS created its EMBA, a cutting-edge program that leverages all the rigor and benefit of its traditional MBA in a flexible format ideal for working professionals. 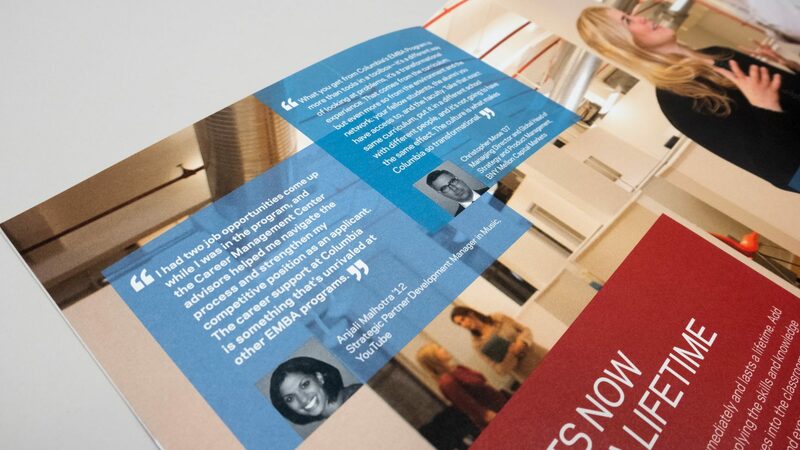 Targeting a sophisticated, career-focused audience, our design solution had to appeal to prospective students both emotionally and intellectually. 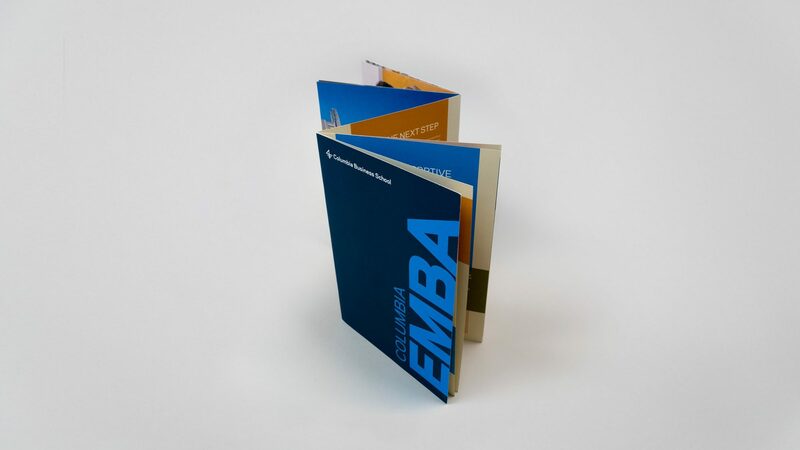 We created a Z-fold, double-cover flipbook that allowed prospective students to learn about the EMBA program’s distinctive features and format from both the front and back of the piece. From one side, prospective applicants paged through narratives of actual students coupled with commissioned photography and program details that brought the EMBA experience to life. We sought to provide a true-to-life glimpse of what a commitment to the program means — and the impact the program has on lives and careers. 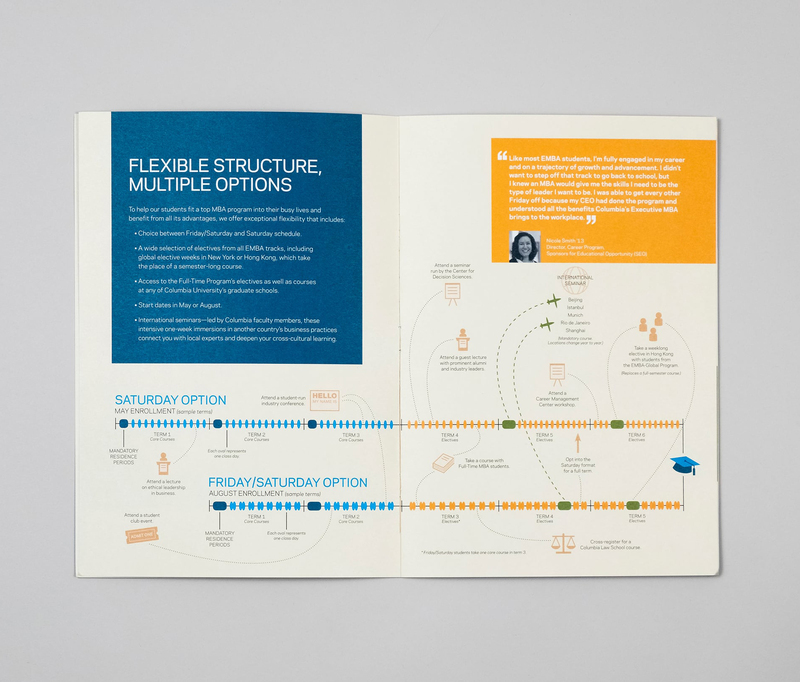 From the other side of the brochure, readers accessed custom-created information graphics that conveyed the details and flexible pathways students take to earn the degree. The clarity of the information allowed students to envision balancing the program with a full-time job. 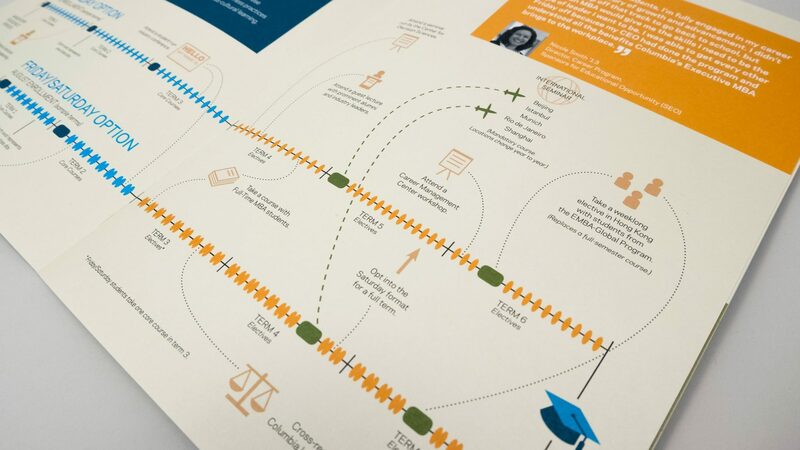 Along with essential information, the data visualizations portrayed the program’s global network, the importance of the EMBA community, the real-world expertise of faculty, and the breadth and depth of the curriculum. Suka’s highly visual approach built an air of excitement and possibility around Columbia’s EMBA program. 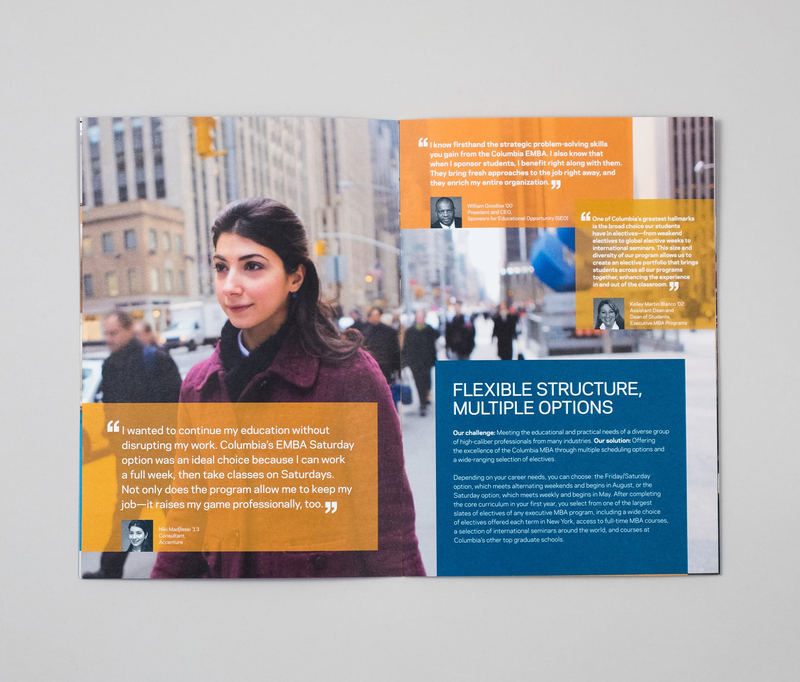 By leveraging photo-driven, narrative spreads from one side of the brochure and data-rich infographics from the other, Suka delivered a viewbook that was engaging, presented information in an easily digestible way, and exuded bold simplicity.